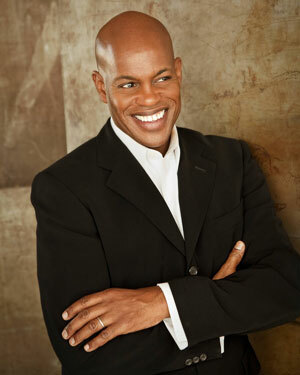 Jubilant Sykes (born in Los Angeles, California) is an American baritone. He has performed with Christopher Parkening and other artists, and has appeared in such venues as the Metropolitan Opera, Deutsche Oper Berlin, Carnegie Hall, the Kennedy Center, London’s Barbican Centre, the Apollo Theater, Hollywood Bowl, New Orleans Jazz Festival and hundreds of other major venues around the world. Sykes performed the role of the Celebrant in the Grammy Award-nominated 2009 recording of Leonard Bernstein’s Mass, with the Morgan State University Choir and Baltimore Symphony Orchestra under Marin Alsop, for Naxos Records. The American baritone Jubilant Sykes brings a new dimension to the traditional career of the classically trained singer by drawing on gospel and jazz influences to deliver performances in differing musical genres. He has had the privilege of working with a number of notable conductors and has been the featured soloist with many of the world’s finest orchestras. His unique gifts have taken him from such diverse stages as the Metropolitan Opera, Deutsche Oper Berlin, Carnegie Hall, the Kennedy Center and London’s Barbican Centre to the Apollo Theater, Hollywood Bowl, New Orleans Jazz Festival and hundreds of other major venues around the world, appearing with a number of leading artists from different musical styles. He has had an important artistic partnership with the legendary American classical guitarist Christopher Parkening, resulting in the acclaimed release of Jubilation for EMI. Two recordings for Sony BMG Masterworks are Jubilant, bringing the singer together with jazz trumpeter and composer Terence Blanchard, and his crossover recording Wait for Me, featuring classic songs by a number of popular composer/entertainers.